Miso soup or “Miso Shiru” is something so synonymous with Japanese cuisine that foreigners worldwide are no stranger to it. Any Japanese restaurant you go to will serve the salty, nutty soup along with your meal. But what actually is miso paste and why is it so good for you? Well, It’s actually a thick paste of fermented soybeans. Soybeans are mixed with salt, koji fungus and sometimes other grains as well like barley or rye. They’re a very good source of vitamins and minerals as well as aiding in gut health thanks to its probiotic components. Not just for soup, the versatile paste is also used for a multitude of other things such as sauces and marinades. For this 5-Ingredient one, I’ve kept to the classic ingredients but added salmon bones. 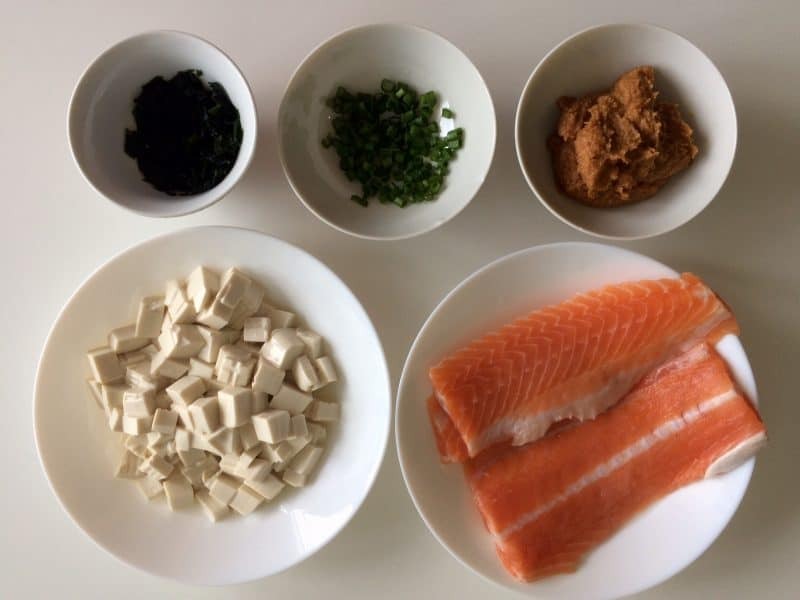 I’ve also omitted the dashi stock to reduce the number of ingredients and because boiling the salmon acts as fish stock as well. Most Japanese restaurants that butcher their own whole salmon tend to throw away the spines along with all the precious meat connected to it. You can get them dirt cheap at the supermarket right next to the beautiful fillets and butterfly fillets for less than a quarter of the price. They’re sold as scraps and while not the best choice for frying, boiling them in soup makes the meat fall right off the bones for ease of eating! If serving to younger children, just be sure to either serve without the salmon pieces or to scrape it off with a fork first. STEP FIVE – SCOOP UP AND SERVE! After 10 minutes on medium heat, slowly add in the tofu and wakame. Stir from time to time by using the back of your ladle to avoid breaking up the tofu. If using frozen salmon bones, defrost them and rinse. They shouldn’t take too long to defrost, around 3-4 minutes in the microwave on the defrost setting or lowest wattage. You can also wrap them in plastic and run them under tap water for 5-10 minutes. Use a cleaver to quarter them into pieces roughly 2 inches wide. As for the tofu, use a sharp, non serrated knife to cut them into small cubes. Be careful as silken tofu is very fragile. Rinse the dried wakame and set aside. As salmon is a relatively fatty fish (although mostly good fat such as omega-3’s), we’ll have to pre-boil them to ensure the soup is clear and doesn’t have too many impurities. Put the salmon pieces straight into cold water and bring it to a boil. You’ll see a lot of little white bits floating on the top. Pour this water away and refill clean water into the pot, 1.5 litres should be sufficient. However, even after pre-boiling there will most likely still be hints of fat floating about, don’t fuss too much about these as the miso paste will help cover up the appearance. After 10 minutes on medium heat, slowly add in the tofu cubes and rinsed wakame. Turn the heat down to medium-low heat as vigorous boiling may disintegrate the tofu. Stir from time to time by using the back of your ladle to once again, avoid breaking up the tofu. Just 5 minutes at this heat is enough. Now, don’t just drop a whole dollop of miso paste into the pot while it’s boiling. You want to turn off the heat first before adding it in as high heat can kill the beneficial probiotics in the paste and alter the taste of the soup overall. While leaving the pot on the unlit stove, use a sieve to slowly dissolve the paste into the soup. Use the back of your ladle or a spoon to help you press it through the sieve. This also maintains the shape of the tofu as opposed to stirring the miso paste directly in the pot in an attempt to dissolve it. It’s just as simple as that! Sprinkle the scallions generously over the soup and serve piping hot! Before drinking, stir it up a little as the miso particles will rest at the bottom after standing for awhile. For a true Japanese experience, drink the soup straight out of the (small) bowl. No soup spoon necessary here! While the salmon does help to make it more hearty and flavorful, you can add even more ingredients to your liking depending on what you have in your kitchen. Of course, provided they’re Japanese ingredients, I would imagine bell peppers wouldn’t go very well with miso soup at all. What ingredients did you add to your miso soup? Let us know in the comments!